Piping Plovers like the wide sandy beach and are about as likely in spring as fall, from late April to mid-May and again from mid-July to about Labor Day. 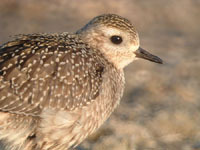 American Golden-Plovers are seen every fall in September, usually flying over the beach. They are occasionally seen in spring as well. Black-bellied Plovers are seen in the spring and fall and are more likely to spend time on the beach than the American-Golden Plover. Willets are seen every spring, usually in late April and early May, and again in late summer, starting in early July and running through August. Large flocks of 20 or more birds are not uncommon. Baird's Sandpipers are regular in late summer and early fall, beginning in mid-August. An even more uncommon species, the Buff-breasted Sandpiper is seen every fall in small numbers. Though most often seen as flybys, one will sometimes land on the beach where they can be very tame and approachable. Whimbrels are recorded every year, with the third week in May and the period around Labor Day being the best times to see this elegant wader. 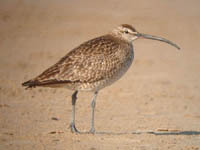 Unlike other shorebirds, Whimbrels can sometimes be seen away from the beach, walking on the grass or rocks, and like the Buff-breasted can be very tame. Red Knots have been recorded a number of times over the years, mostly juveniles in August and September. During the late 1970's and early 1980's, Red Phalaropes were almost regular at Montrose in November. They were most often seen at the base of the Fishhook Pier, spinning and feeding in the mucky water near the beach. Although one hasn't been seen at Montrose in a few years, this species should still be looked for in November and December. American Woodcocks are often flushed from the hedges and underbrush in March and October. They can also be seen flying in off of Lake Michigan after a night of migration. Finally, Wilson's Snipes can be found in the Meadow and Dunes in April and September and October; like the woodcock they usually make their presence known only after being flushed.